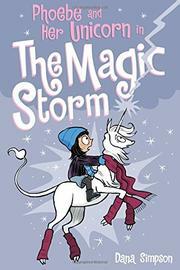 In their sixth adventure, Phoebe and her best pal, Marigold the unicorn, must determine the cause of a magical storm. With a big heart and a smattering of freckles, plucky Phoebe returns with her BFF Marigold, a white unicorn with a flowing mane and a healthy dose of narcissism. When an ice storm hits their town, Marigold suspects that the storm may not be natural. The pair, aided by bespectacled Max and longtime frenemy Dakota, must venture out to find a mysterious dragon that may hold the answers. As the series progresses, Simpson’s volumes have become more substantial, with a greater emphasis on narrative development than reliance on jokes. This volume is one of her strongest, adding new dimensions to her ever expanding universe and paving the way for more entertaining shenanigans ahead. Throughout the series the artwork never falters, and it has sustained its vibrancy with clean lines and expressive facial details. However, those seeking diversity within the panels may be torn: Max has two moms, but the entire cast is predominantly white. After the adventure ends, young unicorn aficionados need not despair; Simpson includes bonus materials with ideas for tasty drinks, experiments, and information about electricity.